BASKETBALL SPOTLIGHT NEWS: G3IE Headed To The AC Showcase With Something To Prove! G3IE Headed To The AC Showcase With Something To Prove! 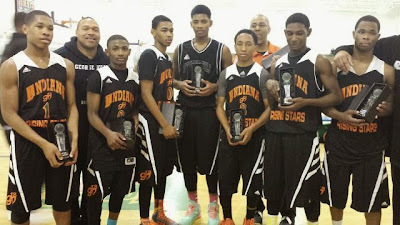 George Hill All Stars recently merged with Indiana Elite and they are ready to hit the road. G3IE features several nationally ranked players including Kevin Easley, Antwaan Cushingberry and K.J Coleman. Here next stop will be the AC Showcase where they feel they have a score to settle with the “Supreme Team”. During the 7th Grade AAU Nationals in Memphis Team IZOD narrowly defeated George Hill All Stars in the Sweet 16 before advancing to the championship. Coach Michael Saunders feels the AC Showcase will be a great experience for his program. “The reason I felt it was important to come to Atlantic City was to support Basketball Spotlight and prove we can compete with some of the top teams on the East Coast. My 8th Grade team wants another shot at IZOD while my 6th Graders want to play Team Takeover and Team Glory. We look forward to this experience” he finished. The Atlantic City Showcase is loaded this year and should be nothing short of spectacular. Stay tuned as we bring your more of the top teams heeded down to America’s Playground. The AC Showcase takes place April 19th and 20th so don’t miss it.